Marshmallows and Chocolate, Oh My! 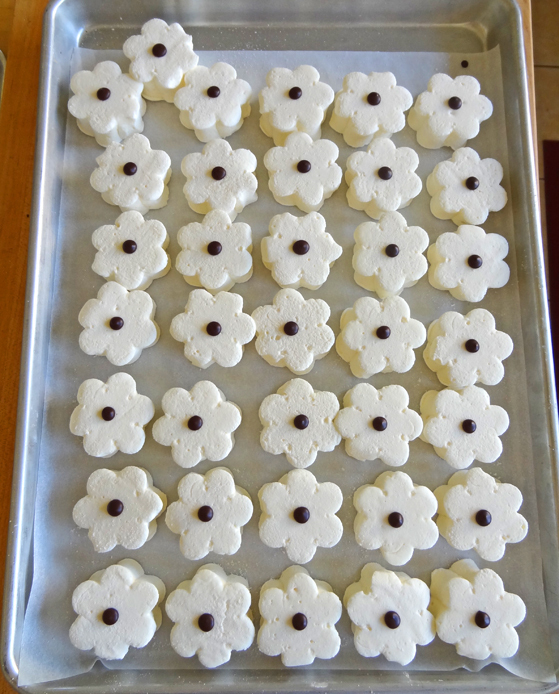 Unfortunately, cutting those fun shapes leaves a lot of marshmallow “waste.” What to do with the leftover marshmallow bits — the pieces in between the daisy cutouts — not to mention the extra pound of chocolate I’d tempered? Oh sure, you could eat them, but I wanted a creative food-waste solution. 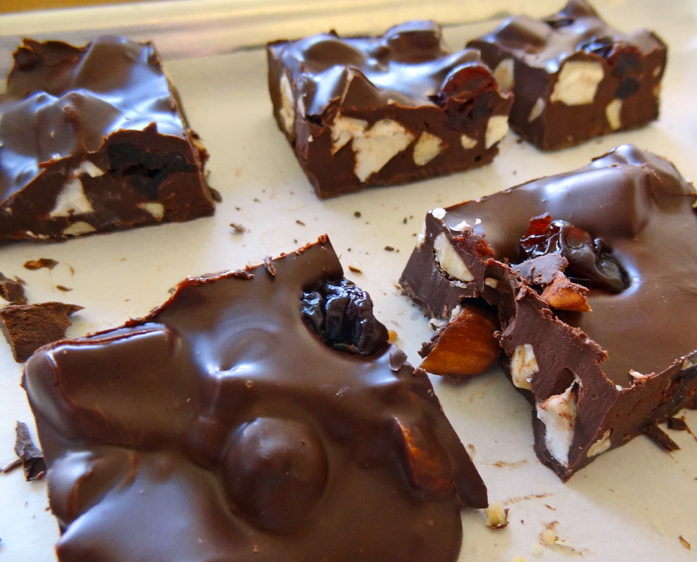 And then it came to me: Rocky Road! I’ve always thought of Rocky Road as a classic American confection, but according to Wikipedia, it was created in Australia. Who knew?! (Hey, necessity is the mother of invention.) I know, Rocky Road isn’t exactly a typical Easter confection, but it does have the key elements: Chocolate and Marshmallows. Ta-dah! My Easter Rocky Road made with 61% dark chocolate, passion fruit marshmallows, dried sour cherries, and roasted, salted almonds. The result is a treat that combines textures and flavors: soft, sweet, fruity, tart, salty, crunchy, nutty, and of course, chocolatey. Yep — all that in just a couple of bites (not to mention a solution for those marshmallow leftovers)! That’s what I’m enjoying for Easter this year. What are your Easter indulgences or nostalgic Easter treats? § 3 Responses to Marshmallows and Chocolate, Oh My! It looks wonderful and super yummy, but where can we find the recipes? Hi Isabelle! Thanks for reading the post and for your sweet comment :-). Recipes are coming! In the meantime, for an easy vanilla marshmallow recipe, check out Smitten Kitchen (http://smittenkitchen.com/blog/2009/06/springy-fluffy-marshmallows/) — she has great photos and detailed instructions. You are currently reading Marshmallows and Chocolate, Oh My! at 650Food.